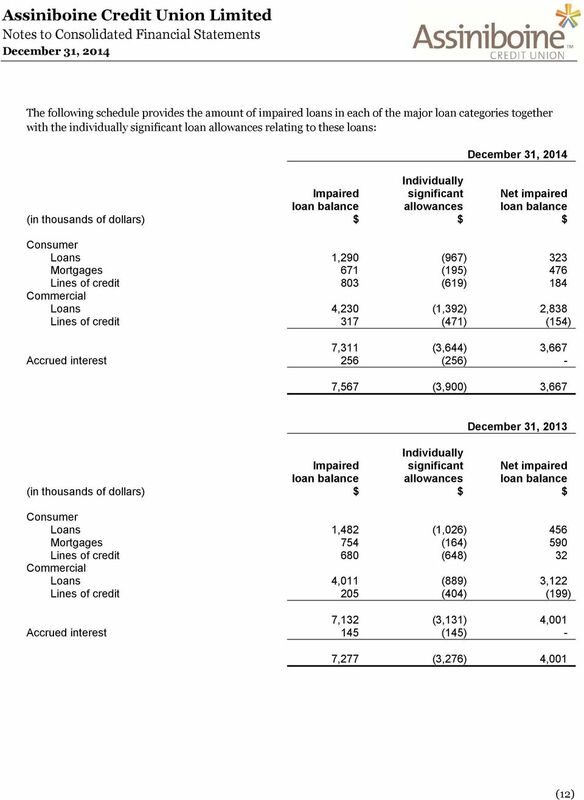 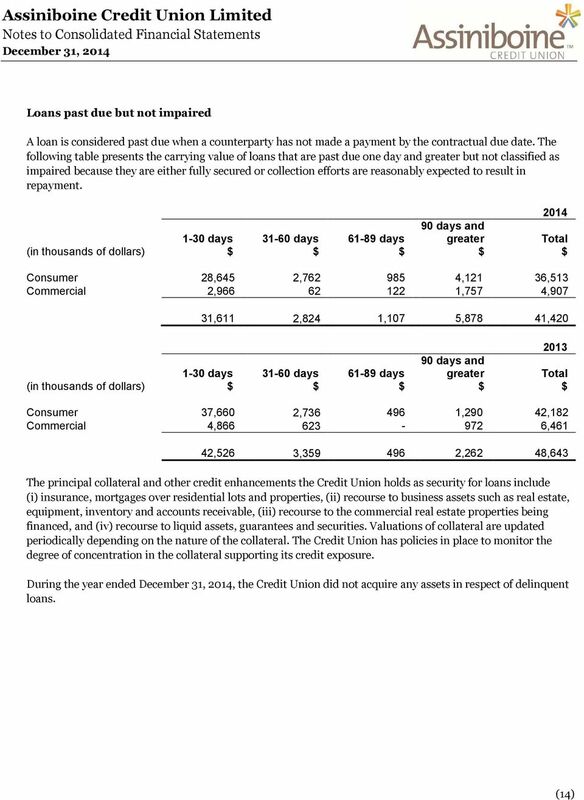 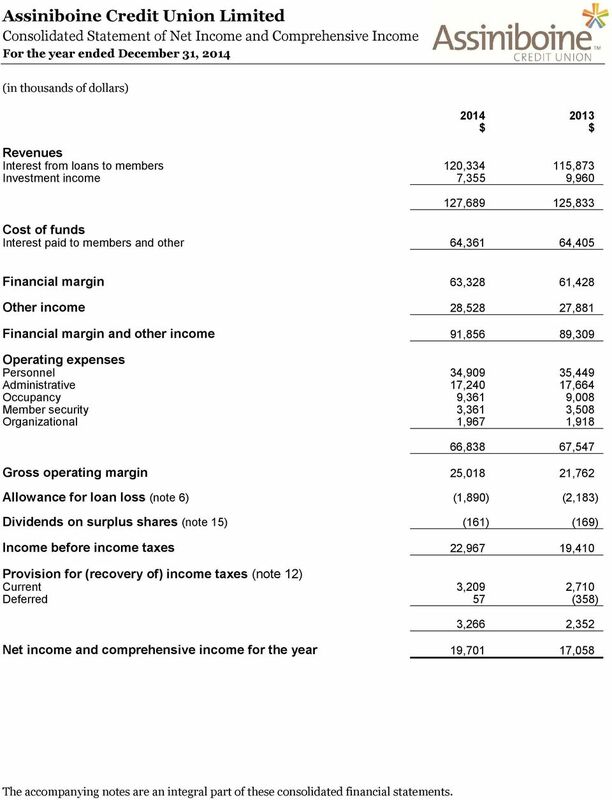 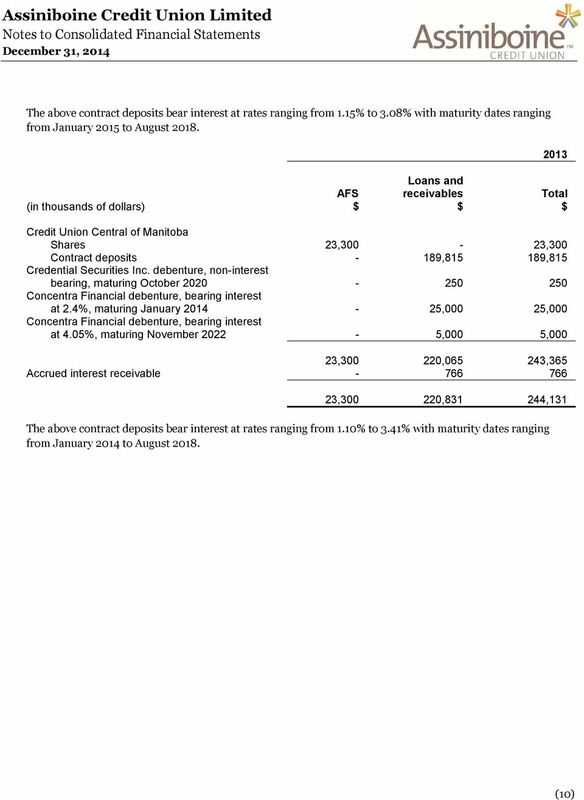 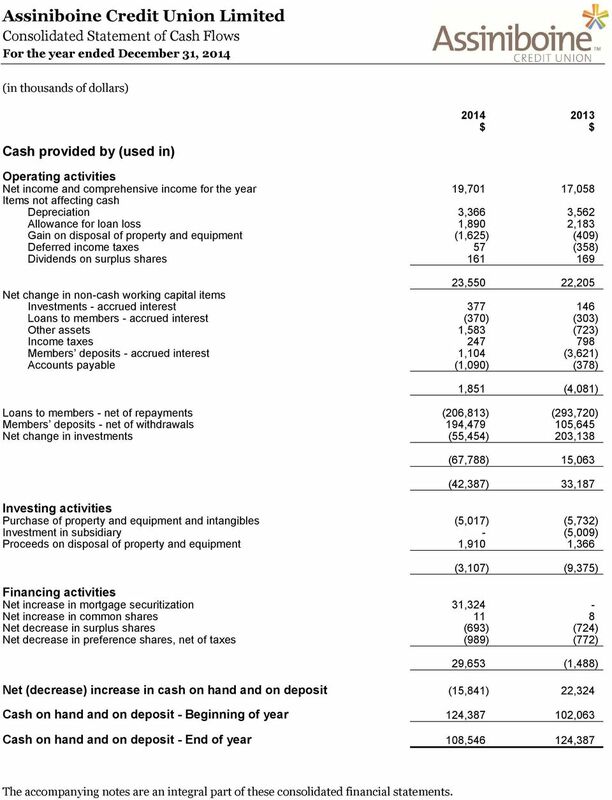 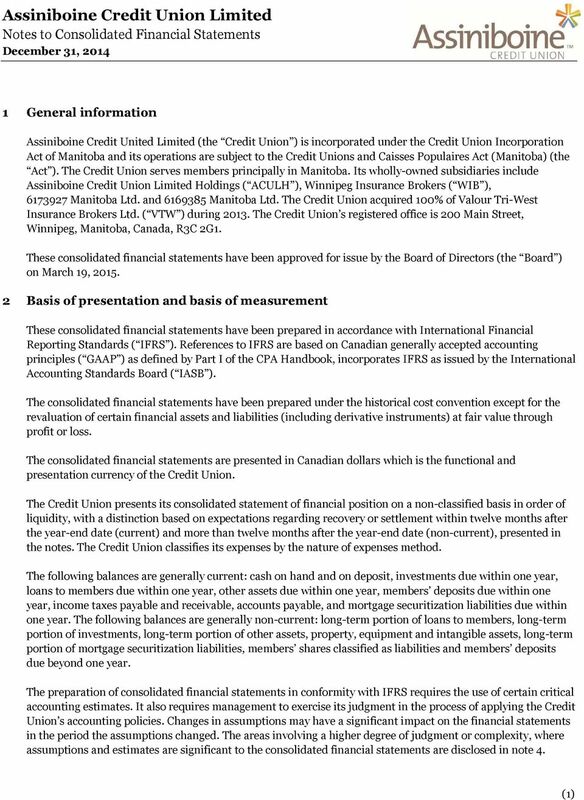 2 March 19, 2015 Independent Auditor s Report To the Members of Assiniboine Credit Union Limited We have audited the accompanying consolidated financial statements of Assiniboine Credit Union Limited and its subsidiaries, which comprise the consolidated statement of financial position as at December 31, and the consolidated statements of net income and comprehensive income, changes in members equity and cash flows for the year then ended, and the related notes, which comprise a summary of significant accounting policies and other explanatory information. 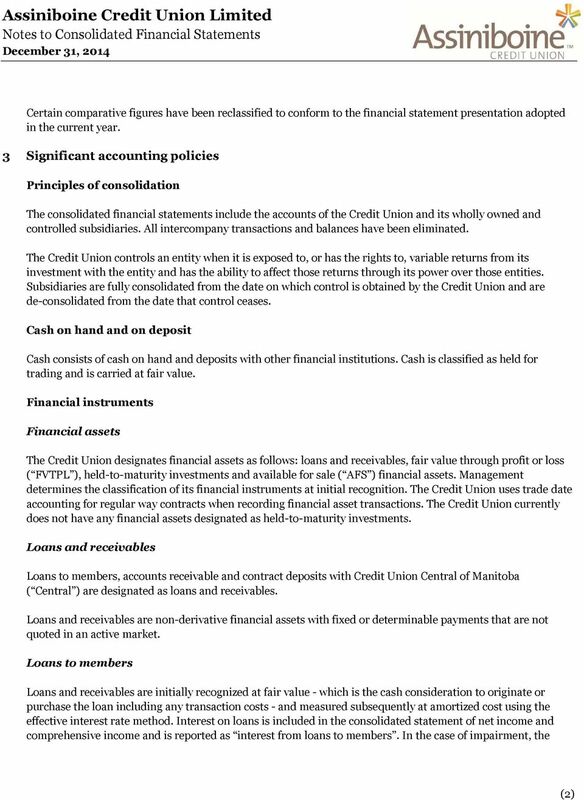 Management s responsibility for the consolidated financial statements Management is responsible for the preparation and fair presentation of these consolidated financial statements in accordance with International Financial Reporting Standards, and for such internal control as management determines is necessary to enable the preparation of consolidated financial statements that are free from material misstatement, whether due to fraud or error. 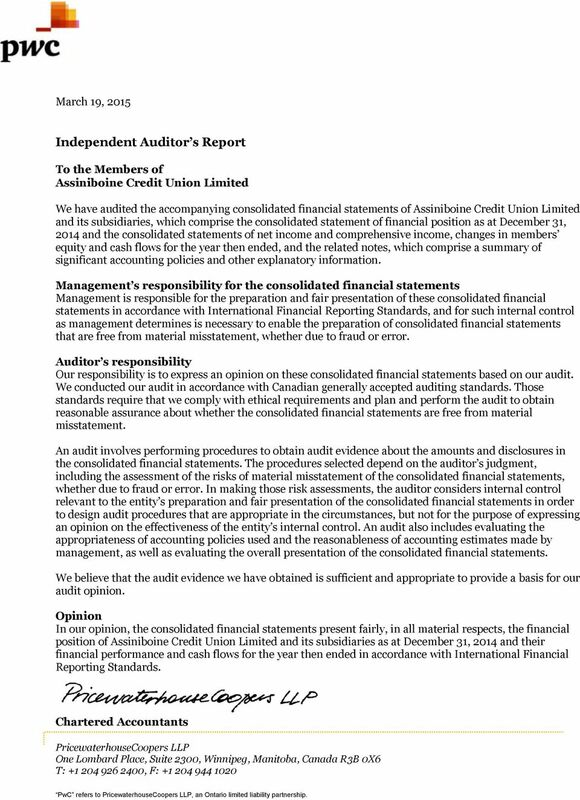 Auditor s responsibility Our responsibility is to express an opinion on these consolidated financial statements based on our audit. 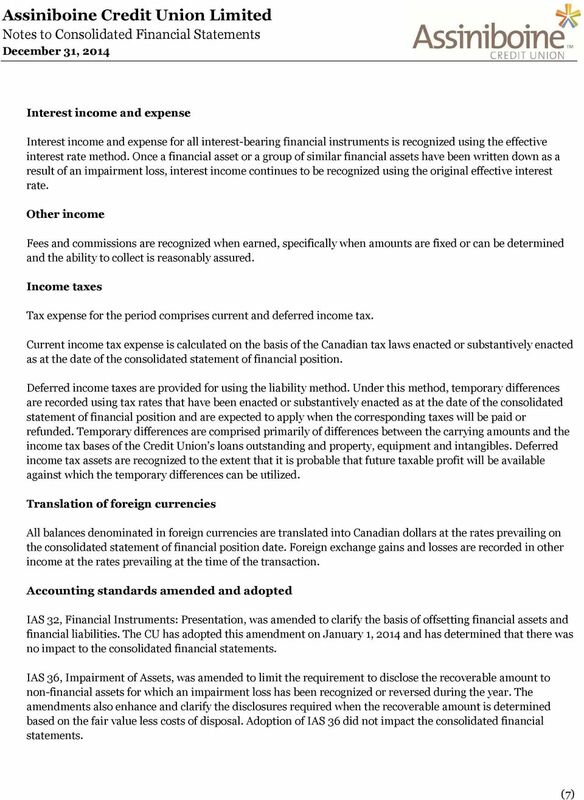 We conducted our audit in accordance with Canadian generally accepted auditing standards. 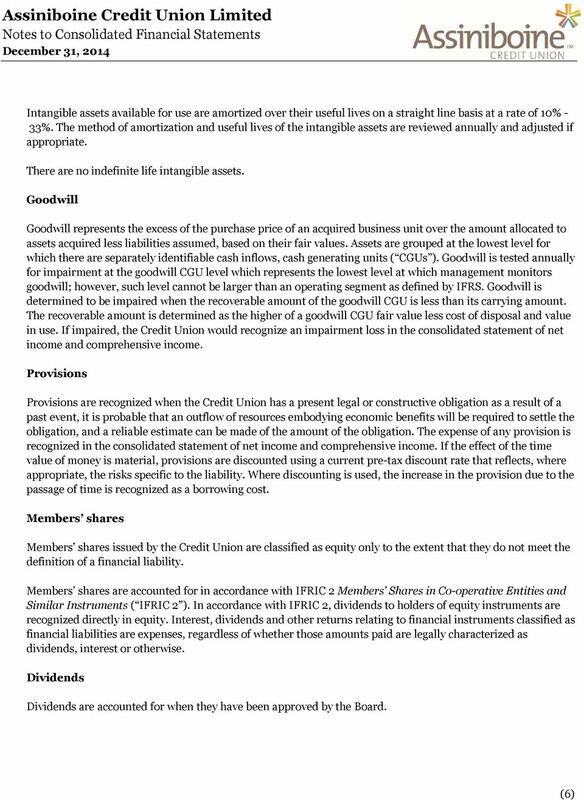 Those standards require that we comply with ethical requirements and plan and perform the audit to obtain reasonable assurance about whether the consolidated financial statements are free from material misstatement. 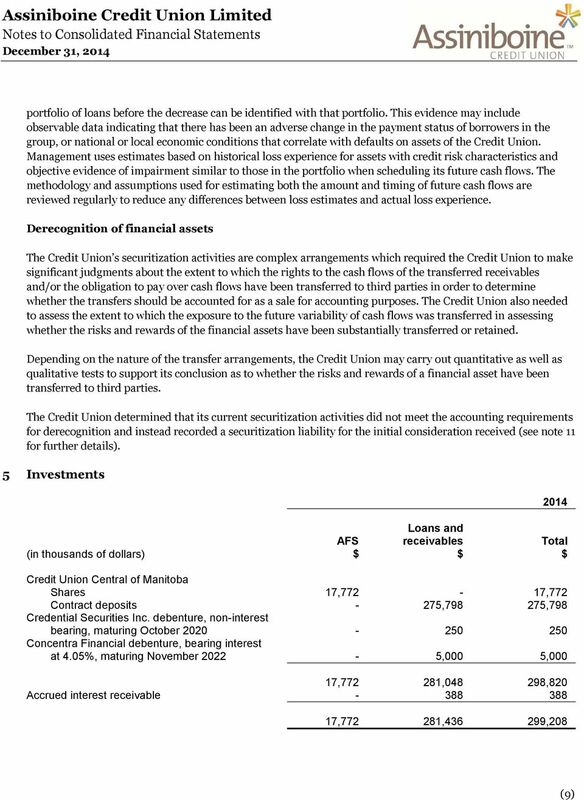 An audit involves performing procedures to obtain audit evidence about the amounts and disclosures in the consolidated financial statements. 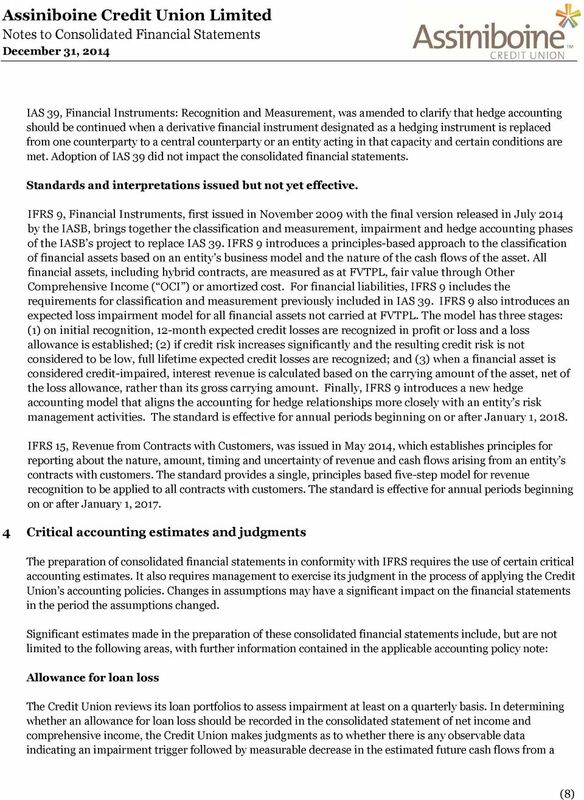 The procedures selected depend on the auditor s judgment, including the assessment of the risks of material misstatement of the consolidated financial statements, whether due to fraud or error. 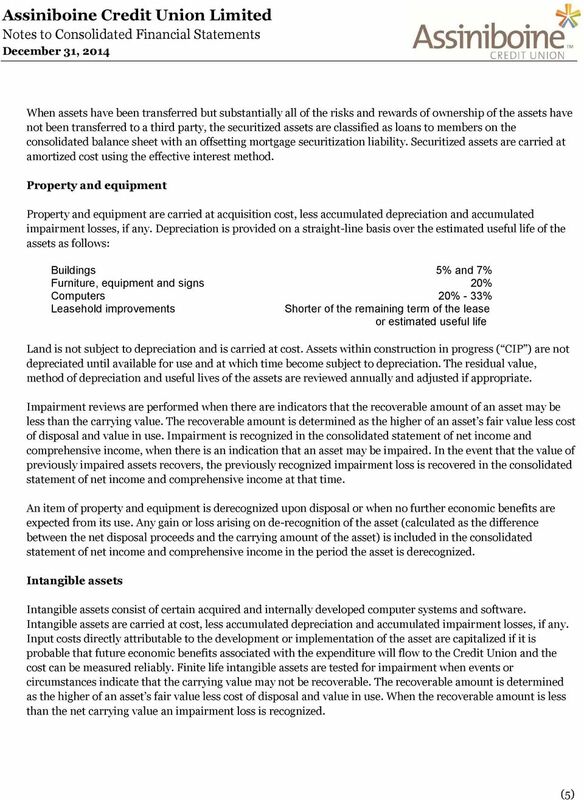 In making those risk assessments, the auditor considers internal control relevant to the entity s preparation and fair presentation of the consolidated financial statements in order to design audit procedures that are appropriate in the circumstances, but not for the purpose of expressing an opinion on the effectiveness of the entity s internal control. 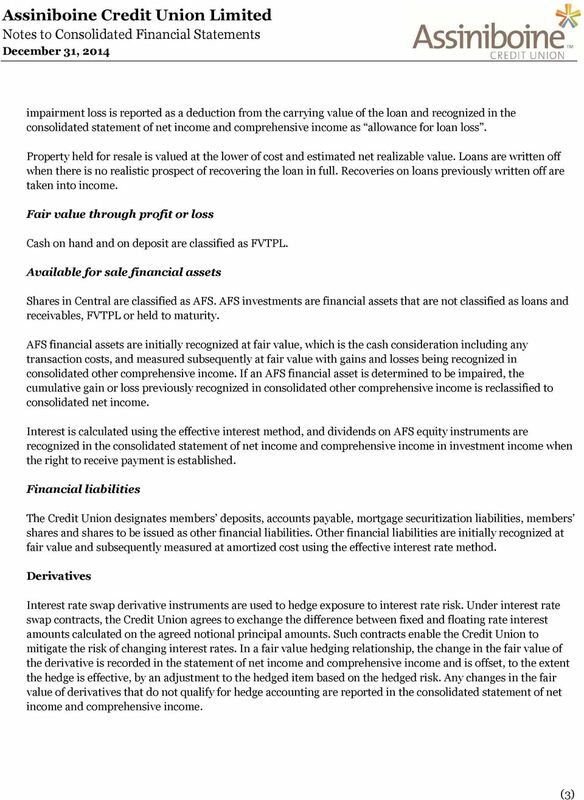 An audit also includes evaluating the appropriateness of accounting policies used and the reasonableness of accounting estimates made by management, as well as evaluating the overall presentation of the consolidated financial statements. 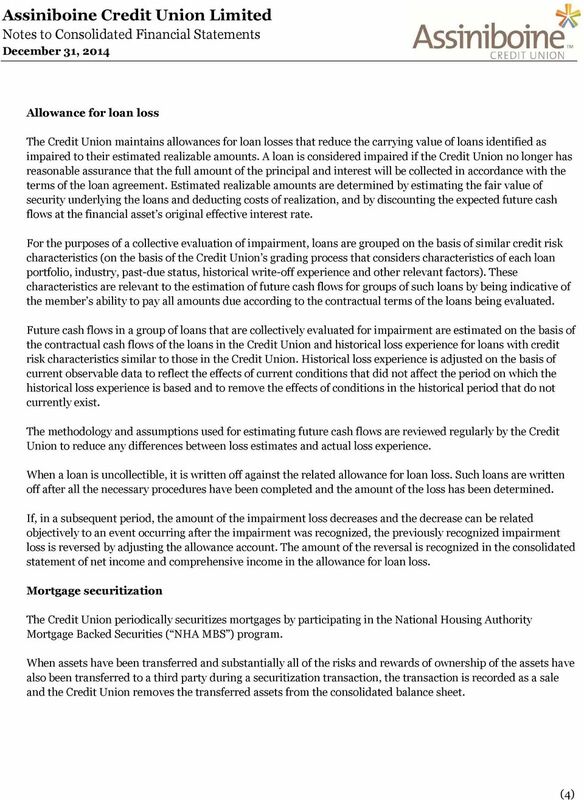 We believe that the audit evidence we have obtained is sufficient and appropriate to provide a basis for our audit opinion. 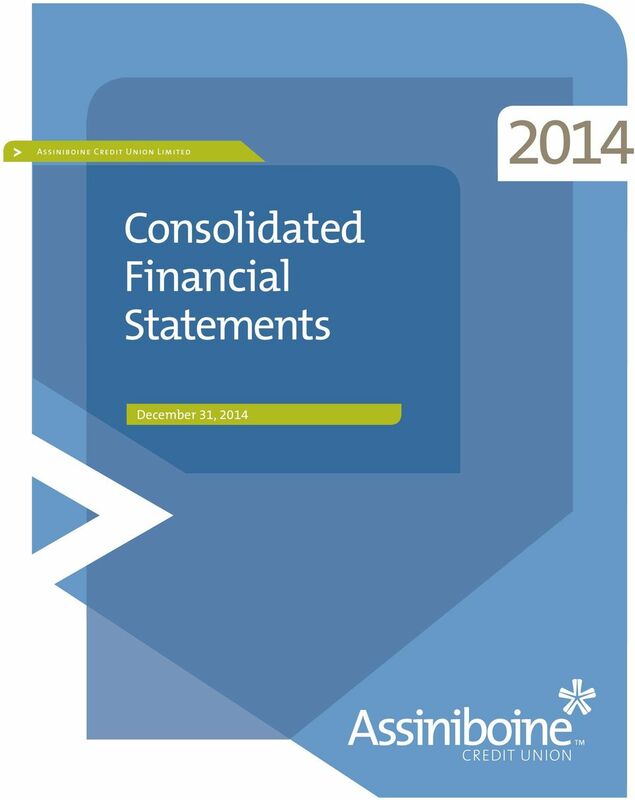 Opinion In our opinion, the consolidated financial statements present fairly, in all material respects, the financial position of Assiniboine Credit Union Limited and its subsidiaries as at and their financial performance and cash flows for the year then ended in accordance with International Financial Reporting Standards. 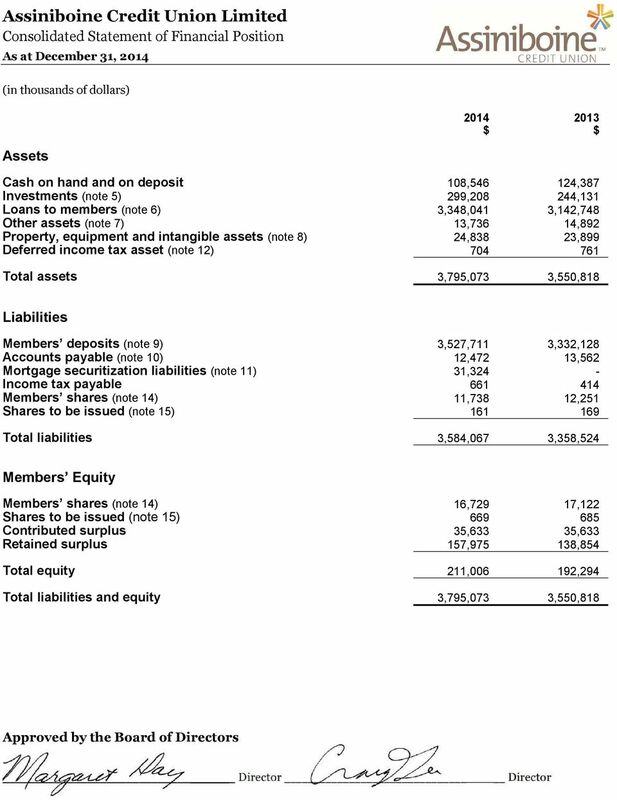 Chartered Accountants PricewaterhouseCoopers LLP One Lombard Place, Suite 2300, Winnipeg, Manitoba, Canada R3B 0X6 T: , F: PwC refers to PricewaterhouseCoopers LLP, an Ontario limited liability partnership. 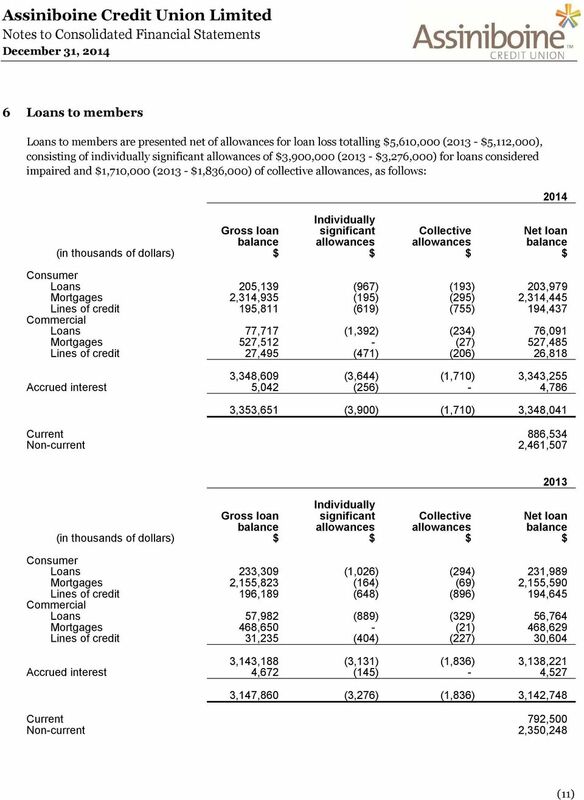 4 Consolidated Statement of Net Income and Comprehensive Income For the year ended Revenues Interest from loans to members 120, ,873 Investment income 7,355 9, , ,833 Cost of funds Interest paid to members and other 64,361 64,405 Financial margin 63,328 61,428 Other income 28,528 27,881 Financial margin and other income 91,856 89,309 Operating expenses Personnel 34,909 35,449 Administrative 17,240 17,664 Occupancy 9,361 9,008 Member security 3,361 3,508 Organizational 1,967 1,918 66,838 67,547 Gross operating margin 25,018 21,762 Allowance for loan loss (note 6) (1,890) (2,183) Dividends on surplus shares (note 15) (161) (169) Income before income taxes 22,967 19,410 Provision for (recovery of) income taxes (note 12) Current 3,209 2,710 Deferred 57 (358) 3,266 2,352 Net income and comprehensive income for the year 19,701 17,058 The accompanying notes are an integral part of these consolidated financial statements. 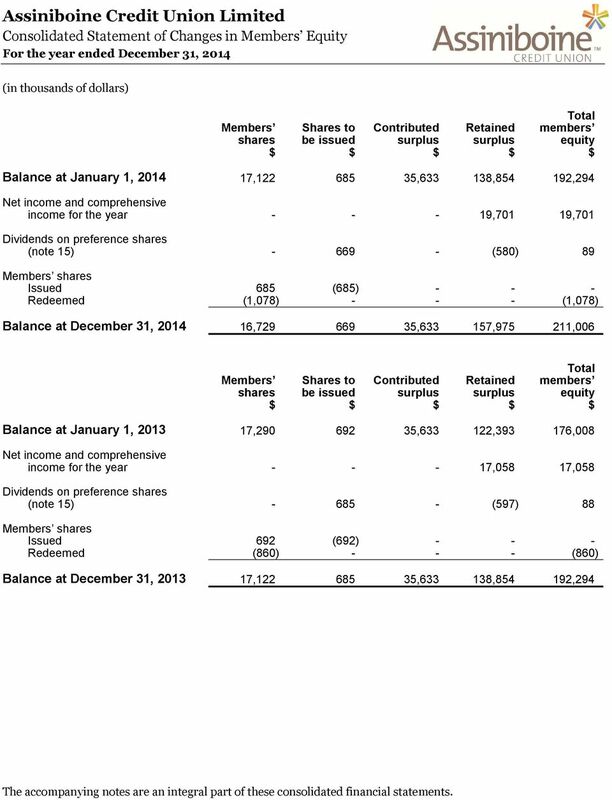 5 Consolidated Statement of Changes in Members Equity For the year ended Members shares Shares to be issued Contributed surplus Retained surplus Total members equity Balance at January 1, 17, , , ,294 Net income and comprehensive income for the year ,701 19,701 Dividends on preference shares (note 15) (580) 89 Members shares Issued 685 (685) Redeemed (1,078) (1,078) Balance at 16, , , ,006 Members shares Shares to be issued Contributed surplus Retained surplus Total members equity Balance at January 1, 17, , , ,008 Net income and comprehensive income for the year ,058 17,058 Dividends on preference shares (note 15) (597) 88 Members shares Issued 692 (692) Redeemed (860) (860) Balance at December 31, 17, , , ,294 The accompanying notes are an integral part of these consolidated financial statements. 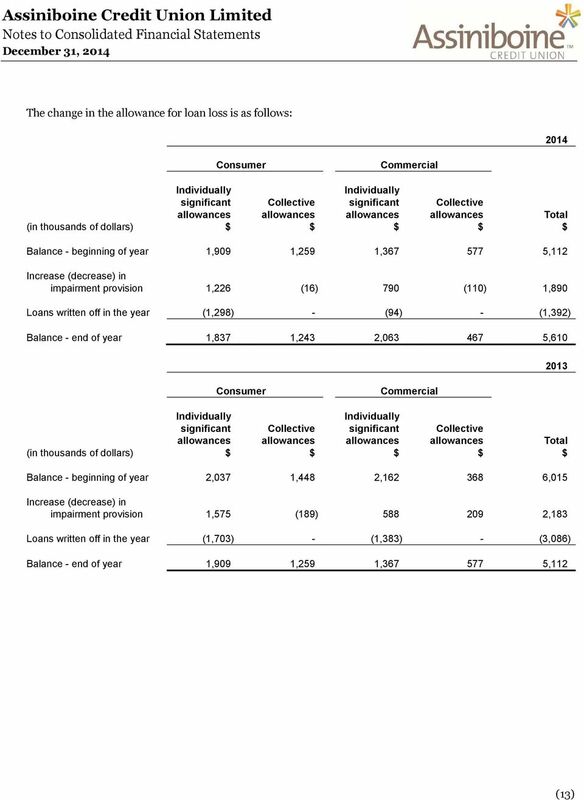 6 Consolidated Statement of Cash Flows For the year ended Cash provided by (used in) Operating activities Net income and comprehensive income for the year 19,701 17,058 Items not affecting cash Depreciation 3,366 3,562 Allowance for loan loss 1,890 2,183 Gain on disposal of property and equipment (1,625) (409) Deferred income taxes 57 (358) Dividends on surplus shares ,550 22,205 Net change in non-cash working capital items Investments - accrued interest Loans to members - accrued interest (370) (303) Other assets 1,583 (723) Income taxes Members deposits - accrued interest 1,104 (3,621) Accounts payable (1,090) (378) 1,851 (4,081) Loans to members - net of repayments (206,813) (293,720) Members deposits - net of withdrawals 194, ,645 Net change in investments (55,454) 203,138 (67,788) 15,063 (42,387) 33,187 Investing activities Purchase of property and equipment and intangibles (5,017) (5,732) Investment in subsidiary - (5,009) Proceeds on disposal of property and equipment 1,910 1,366 (3,107) (9,375) Financing activities Net increase in mortgage securitization 31,324 - Net increase in common shares 11 8 Net decrease in surplus shares (693) (724) Net decrease in preference shares, net of taxes (989) (772) 29,653 (1,488) Net (decrease) increase in cash on hand and on deposit (15,841) 22,324 Cash on hand and on deposit - Beginning of year 124, ,063 Cash on hand and on deposit - End of year 108, ,387 The accompanying notes are an integral part of these consolidated financial statements.